Jackrabbit Mastermind clients may choose to process online payments in Jackrabbit using Studio AutoPay with a Forte Payments gateway. If you are a Jackrabbit Mastermind client, you may opt to use Studio AutoPay / Forte Payments for your integrated online ePayments solution. The set up process is typically 7-10 days. Studio Autopay is only available to customers in the United States. See Contact a Payment Partner for more details. Note: For support of your Forte Payments gateway or merchant processing account please contact them directly at 888 290 5400 option 1. In order to connect your Jackrabbit database to your Forte Payments gateway, we will need 4 pieces of information (gateway credentials) so that we can them to your database settings. You will receive 2 communications from Forte Payments when your gateway and merchant processing accounts are set up. The information is sent to you separately for security purposes. These documents contain the credentials that Jackrabbit needs, the Merchant ID and the Processing\Real-Time Password. Also included in the documents are your Virtual Terminal login credentials, the VT Username and the Virtual Terminal User Password. Keep these credentials for future reference, you will need them to be able to log in to your gateway Virtual Terminal. 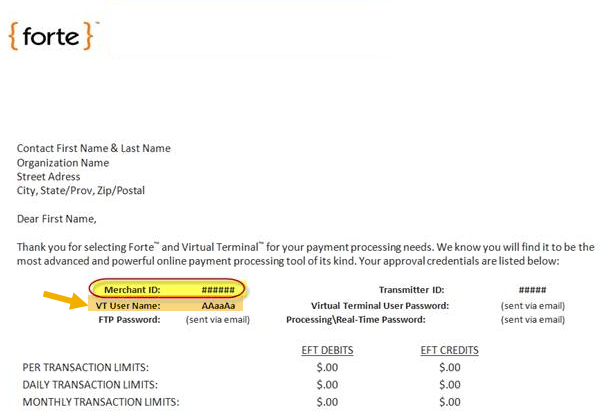 To obtain these credentials you will need to log in to your Virtual Terminal using your VT User Name and Virtual Terminal Password from the Forte Payments documentation. When logged into your database, point to Tools and then Credit Cards/Banks Accounts Settings. Click the Virtual Terminal button. In the VT select Gateway Settings from the left menu. From the options choose Gateway Key. Copy the API Login ID. Do not click to generate a new one. 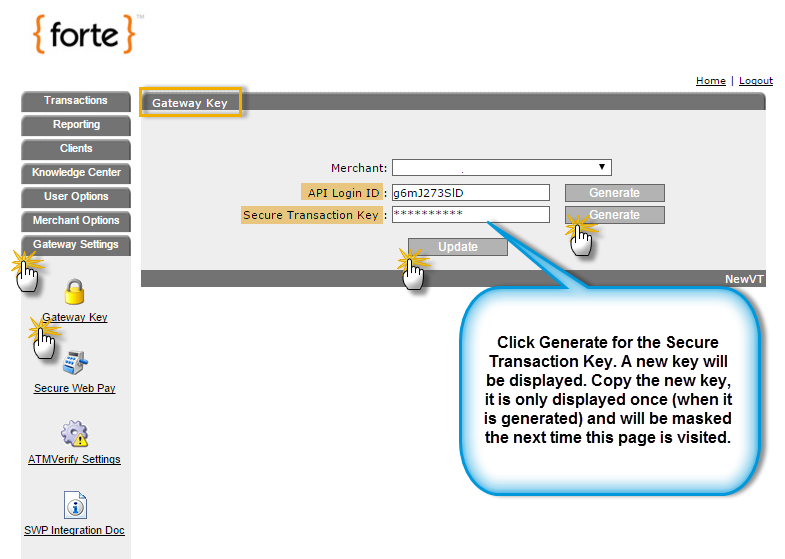 Click Generate next to the Secure Transaction Key. Copy the new Secure Transaction Key. Note: The Secure Transaction Key will only be displayed at the time it is generated. The next time you visit that page, it will be masked. When you have located all four pieces of information use the Support button in your database to submit 2 separate tickets (for security) advising that you would like to connect your Jackrabbit database to your Forte gateway. Submit the 1st Support ticket with the Merchant ID and the API Login ID. Submit the 2nd Support ticket with the Processing\Real-Time Password and the Secure Transaction Key. Jackrabbit Support will make the necessary connections and will send you an email verification. If you have any trouble locating these credentials, contact Wayne Akey directly at wakey@ach-payments.com. A virtual terminal (VT), or merchant login, is an online access point offered by your gateway provider. 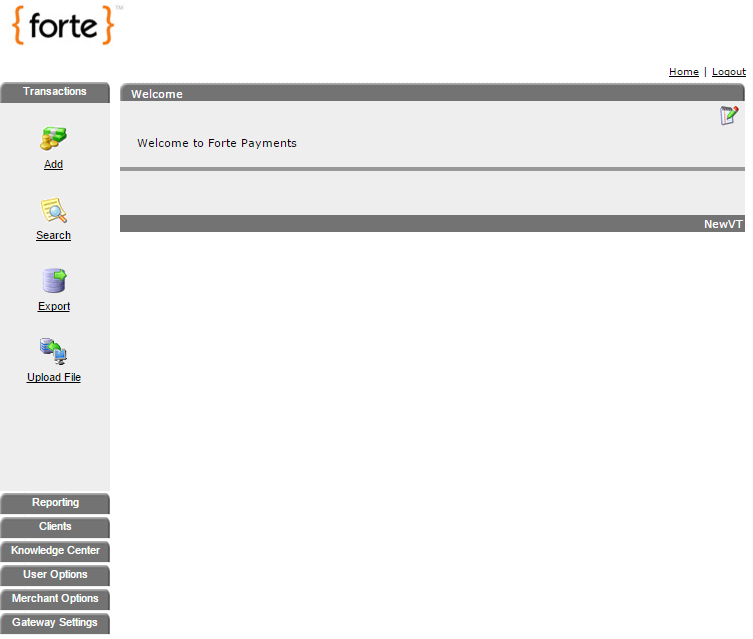 Forte Payments will provide you with your VT User Name and your Virtual Terminal User Password. The virtual terminal provides transaction reporting for all ePayments submitted from your Jackrabbit database. This is key in reconciling your bank account. See ePayments & Bank Reconciliation. As well as processing ePayments from within your Jackrabbit database, payments, refunds, and voids can also be processed from within the virtual terminal but these transactions are not transmitted back to your Jackrabbit database and would have to be recorded manually. If you have recurring payments set up in your Forte Payments gateway and process in that manner, those transactions will have to be manually entered into your Jackrabbit database. Your virtual terminal can be accessed directly from within Jackrabbit by pointing to Tools and clicking Credit Cards/Bank Accounts Settings. 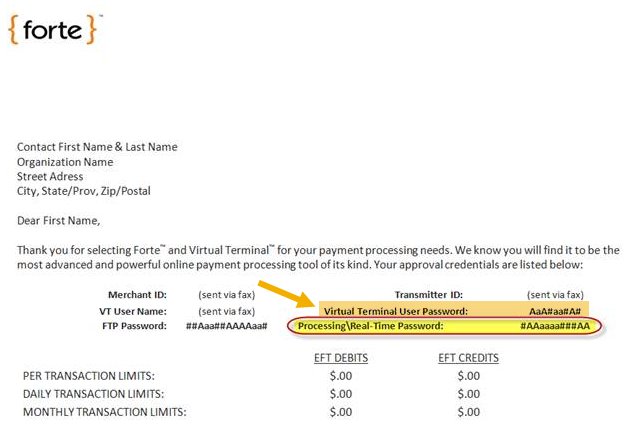 Scroll down to the ePayment Info section to locate the virtual terminal link. For questions regarding the virtual terminal and its use, please refer to your gateway provider. This is not a Jackrabbit application; and we are not able to offer support for it.